* The Cisco 10GBASE-LRM Module supports link lengths of 220m on standard Fiber Distributed Data Interface (FDDI) grade multimode fiber (MMF). * To ensure that specifications are met over FDDI-grade, OM1 and OM2 fibers, the transmitter should be coupled through a mode conditioning patch cord. * No mode conditioning patch cord is required for applications over OM3 or OM4. 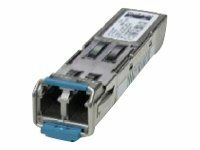 * The Cisco 10GBASE-LRM Module also supports link lengths of 300m on standard single-mode fiber (SMF, G.652).